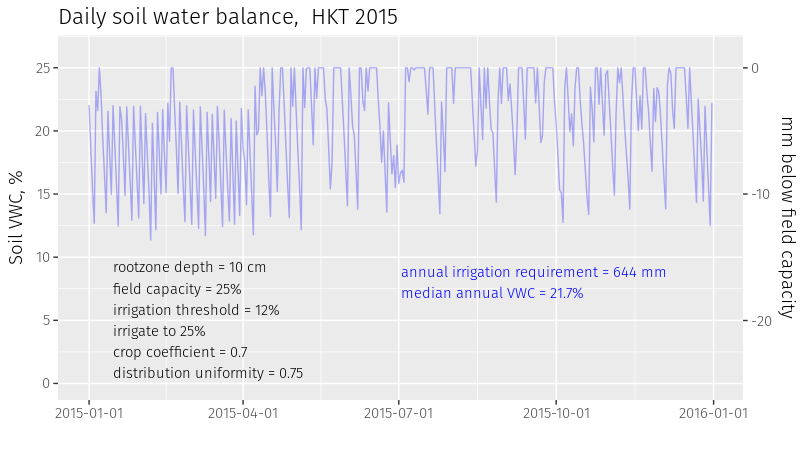 In previous posts, I wrote about the daily soil water balance and irrigation frequency using Bangkok (DMK) weather data, and showed how changes in irrigation "rules" can change a predicted irrigation water requirement, that time using Phuket (HKT) weather data. Thailand conveniently has golf courses adjacent to many of its major airports, so I can imagine turf being maintained at that location, and then make the calculations using data from the airport. Let's go to Chiang Mai. 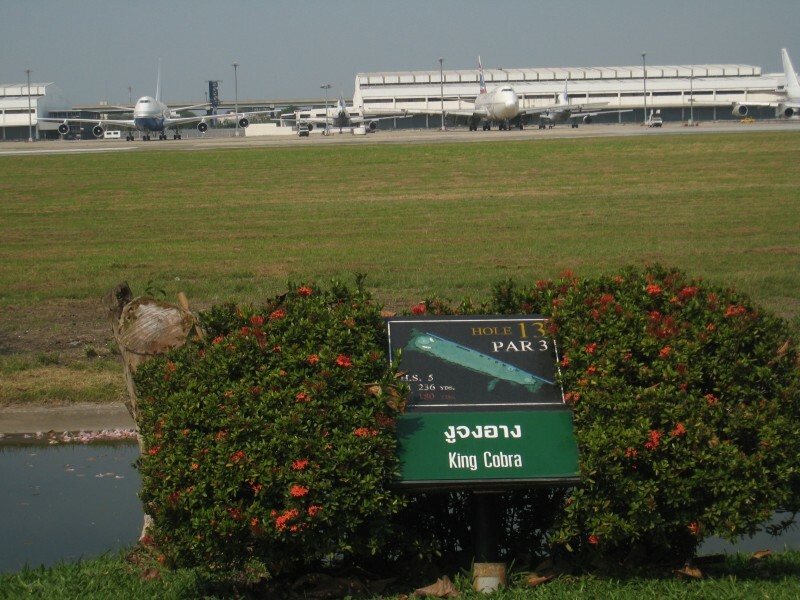 The Star Dome Golf Club sits right next to Chiang Mai International Airport (CNX). Now I want to consider fairways, and specifically the soil type of the fairway. There are a number of advantages to growing fairways in soil, rather than in sand, and using surface and subsurface drainage, and perhaps a bit of sand topdressing, to create the desired playing surface. 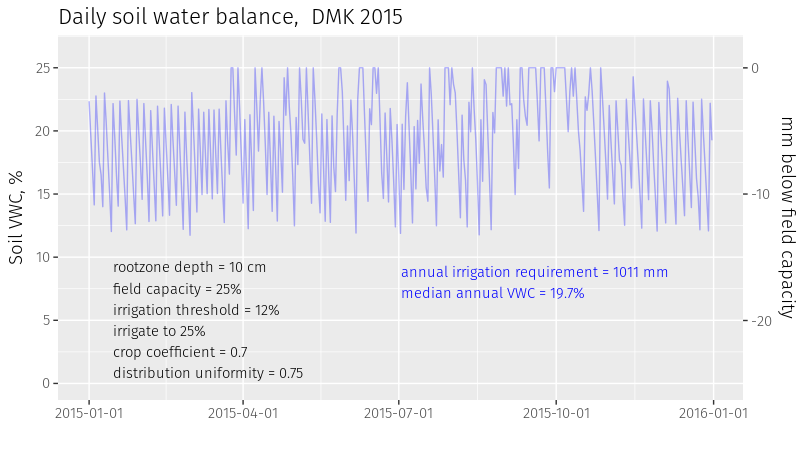 One of the advantages to growing in soil is a lower irrigation water requirement. 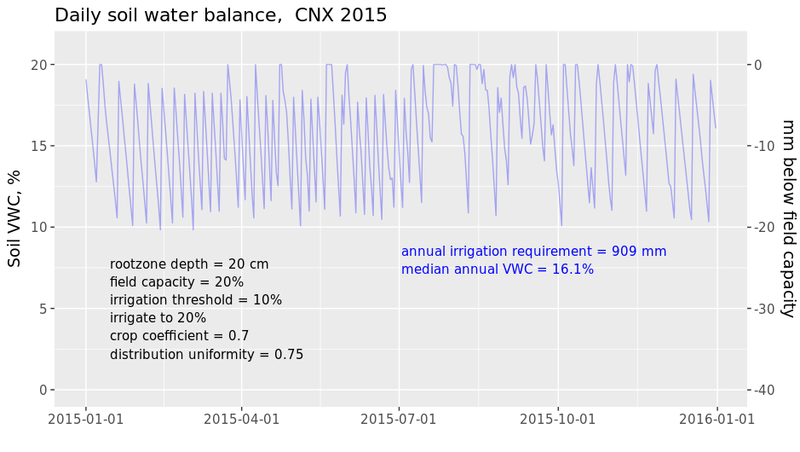 I'll use 2015 weather data from CNX. Let's imagine a fairway with a 20 cm rootzone depth, a field capacity of 40%, and irrigation at 20% to return the soil back to field capacity. 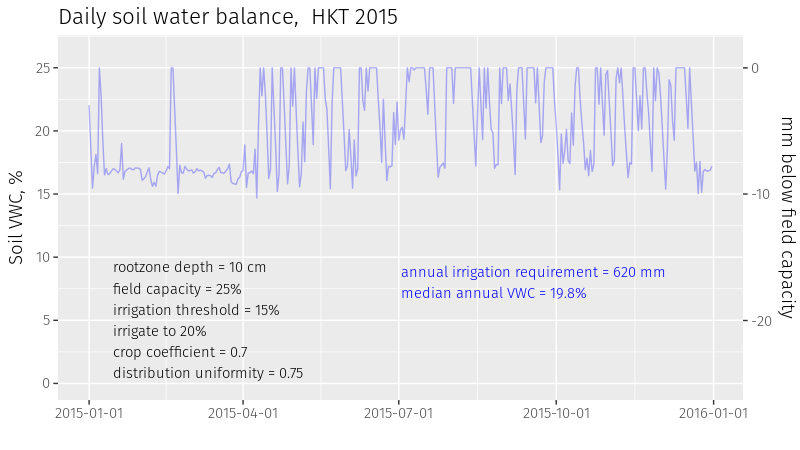 With 2015 weather data, that gives an expected irrigation requirement of 718 mm. 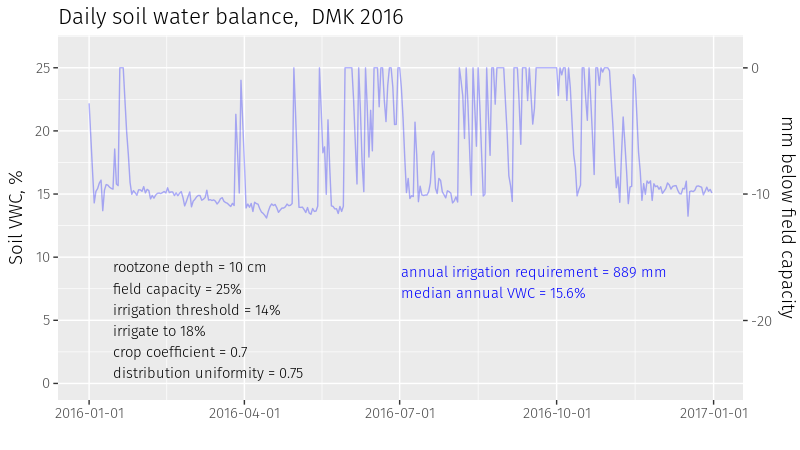 That's a deep and infrequent irrigation regime, and with a 20 cm rootzone depth, about 40 mm will be required at each irrigation event. That's a lot of water. 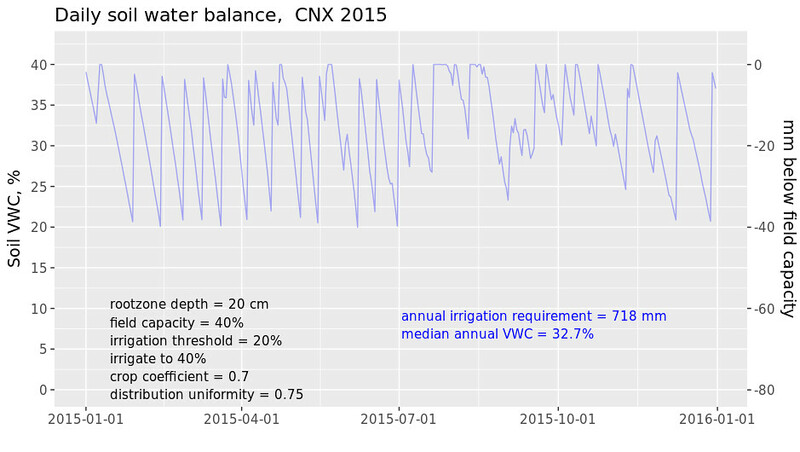 It would probably be more reasonable to do more frequent irrigation. And that can save water too. 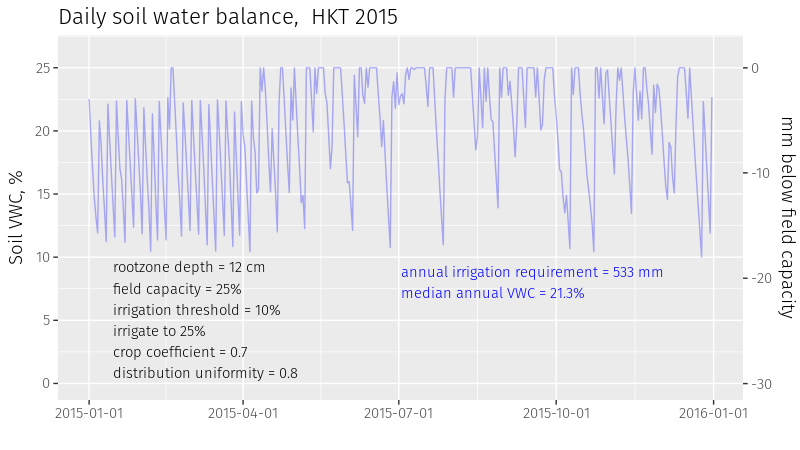 For example, with that same rootzone depth and field capacity, but now irrigating at 24% to increase VWC to 30% (supplying about 12 mm at each irrigation event), the expected irrigation requirement goes down to 674 mm. 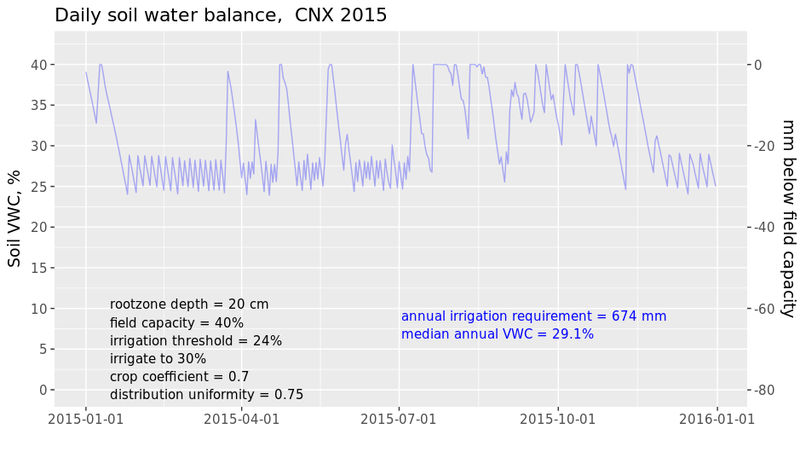 What would the irrigation requirement be for a sand rootzone at CNX in 2015? 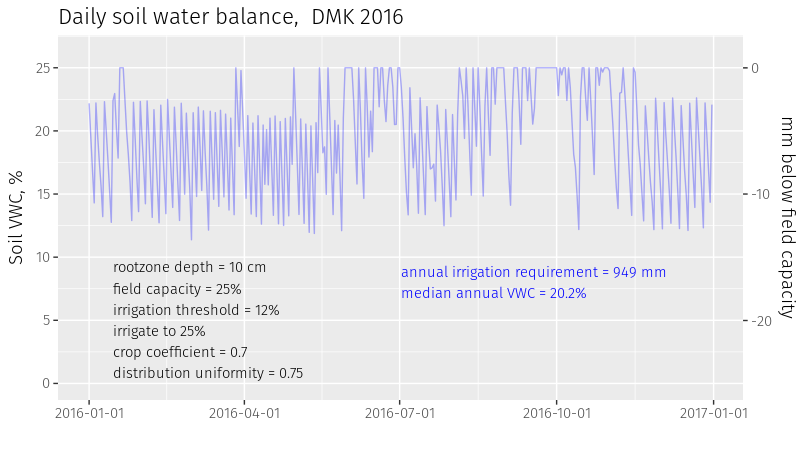 I'll keep the same rootzone depth and the same crop coefficient and distribution uniformity, just changing how much water is held in the rootzone because of the sand. 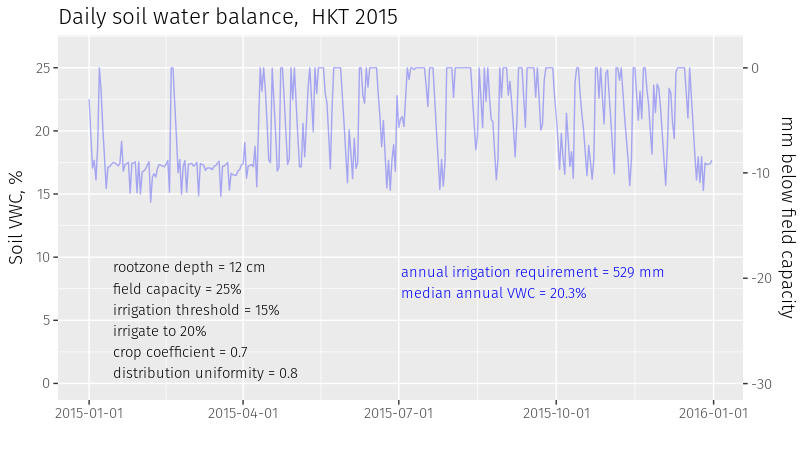 I'll estimate that a fairway sand will have a field capacity of 20% (I think that is a generous estimate) and that irrigation will be supplied at a VWC of 10% to return the soil to field capacity. 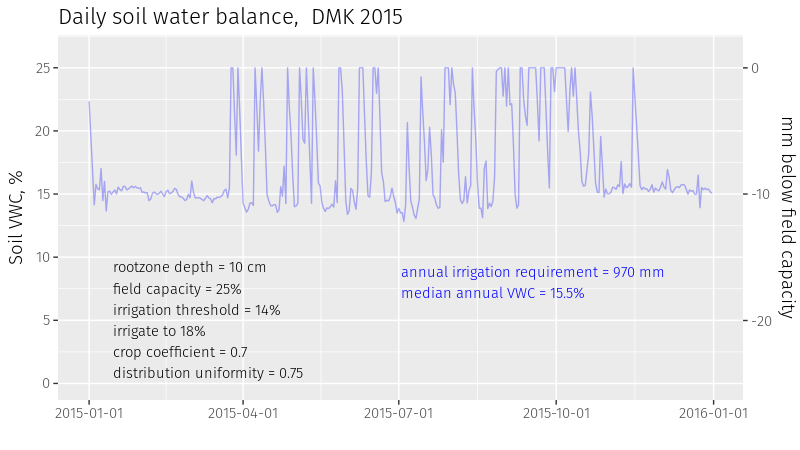 That gives an estimated irrigation requirement of 909 mm. For simplicity, let's say that for the soil rootzone, the irrigation requirement is 700 mm, and for the sand rootzone it is 900 mm. 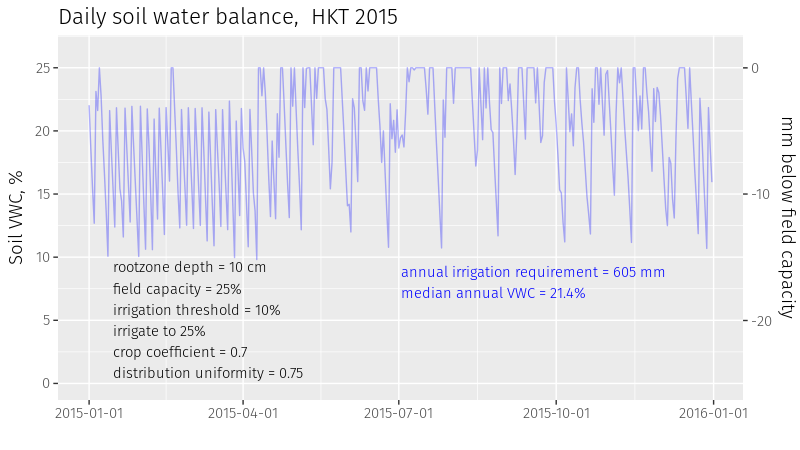 Let's say this water requirement is for 10 ha of irrigated fairways. For the soil fairway condition, that gives an irrigation requirement of 70,000 m3. With a sandcapped fairway, an extra 20,000 m3 are required. Plus the energy to pump the extra water.